I was five years old when I first heard the word "polio". I was seeing a doctor because my legs were not straight. Next to me in the waiting room was a boy with callipers. I asked my mother "will I have to wear those?" She said, "no dear, you don't have polio, you are not crippled". The second time was only a few months later when my sister, brother and I were watching a children's television program. They talked about raising money for crippled children. We decided that we would put on a concert, invite all the neighbourhood children and raise some money. We ended up on television handing over a cheque. Little did we know, that we had handed the cheque to a Rotarian. Fast forward to 1972. I was president of my Interact club. Our local Rotary club in Castle Hill asked us to act as companions at a weekend camp for the then Northcott School for Crippled Children. I discovered that this was the school that Rotary was raising funds to build when I was five years old. 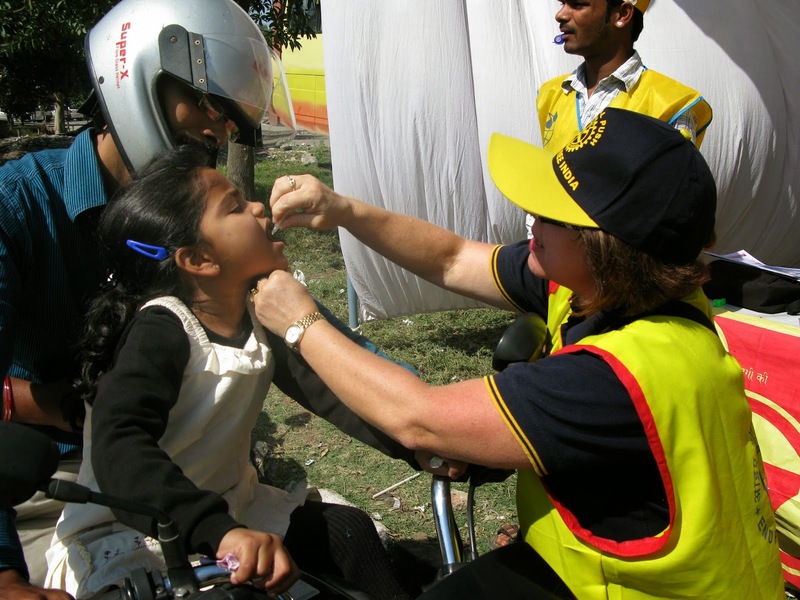 50 years later, I am still involved with the eradication of polio, as a volunteer in India, placing those two precious drops into the mouth of a five year old child, and as donor to our Rotary Foundation. Only six months ago, I found a book that talked about the Crippled Children's Society in Australia. I discovered that in 1928 the president of Rotary International asked Rotary clubs around the world to find the crippled children hidden away in shame, many crippled by polio. Rotary clubs were asked to assist with medical care, to help them walk again, and to give them opportunities though education and vocational training. The great work of Rotary has been woven into my life. I wonder if those Rotarians in 1928 had the vision that India would be declared polio free, and that one day soon, the world will be free of polio. But it is not over yet! In Australia today we still have 400,000 people suffering from the effects of polio, called post polio syndrome, and in New Zealand an estimated 10,000 people who had polio are still alive. Bill Gates Snr summed up the work of Rotary when he said, "back when Rotary became involved with polio, most people thought that voluntary organisations were about tackling projects down the street or across town - not across the world. Rotary changed all that. You reminded us that there is no human problem so daunting that it can't be overcome by people."